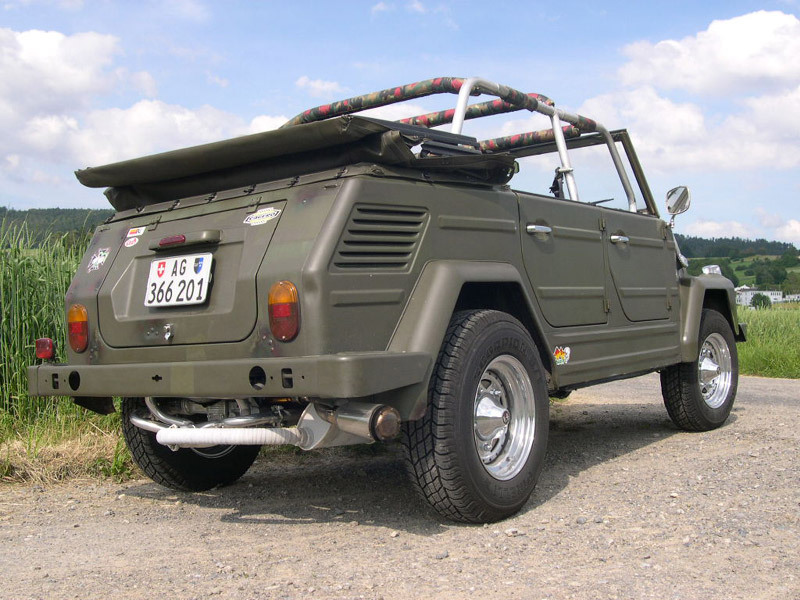 TheSamba.com :: Thing/Type 181 - View topic - What muffler to choose? Posted: Sun Jul 25, 2004 9:12 pm Post subject: What muffler to choose? I have two Things, a '73 and a '74. They both have aftermarket headers that hang below the rear bumper. I see header systems available from the Thing Shop, Things Unlimited, and German Motor Works that protrude out the rear bumper. The beautiful (army green) Thing that's being advertised on The Samba right now has a stock-looking muffler with tips that curl around the ends to protrude out the bumper. My question is: Does anyone have experience with any of these systems to judge the fit and performance relative to their cost? Thanks for your help! I can attest to the original style exhaust (for a '73) that GMW sells. I've had this system in my Thing for a couple of years now and am very happy with it. Mine came from the same european source as the ones that GMW sells, and it's a simple stock replacement. Out of the box, the exhaust tips protruded a little beyond the holes in the rear bumper, so I trimmed them with a pipe cutter (one side more than the other as I recall). This was the only alteration I needed to do, and it was just for my personal preferrences. I've heard of aftermarket through-the-bumper exhaust systems warping slightly under heat, causing the pipes to rattle against the bumper - I experienced no such problems with this system. It's pricey, for sure, but it hasn't caused me any grief, and I prefer to keep my cars as clost to stock as possible. I like the way it sounds, too. Sounds good- If anyone has experience w/ GMW's '74 version, which I believe is from the same European supplier, please let me know. I'm confused. I thought the GMW system for the 73 was a twin-header arrangement, and completely different than the single-muffler unit they sell for the 74. Is there a single-muffler unit for the 73 that deletes the heater box connections? go with the kymco header.. its works great from what ive been told.. thats what mine is!! I'm running the Kymco header with tuck away muffler as well and am very happy with it. I'm running the Kymco 1 5/8" header and the Fatboy muffler. I hate the way the muffler sticks out. Tim, can you be more specific about your muffler? Got any pics? I would like to "clean" the look up a bit without giving away any performance to a hide-away muffler. Thanks. Richard. You are correct: the exhaust system that GMW sells for the '73 Thing is totally different than that which they sell for the '74. In fact both systems are stock replacements for each year because of specific differences in the types of heating systems used in each year ('73 used only a seperate gas heater, while '74 used heat from the exhaust headers). 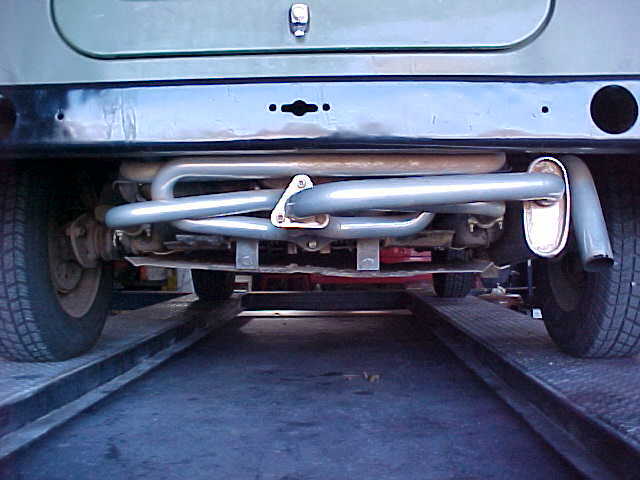 The '73 system is a divided header, dual muffler, dual exhaust system (i.e., one set of headers, muffler and exhaust pipe for the left side, and a seperate set of headers, muffler and exhaust pipe for the right side). The system fits neatly exactly where it's supposed to, and the mufflers, pipes, etc. 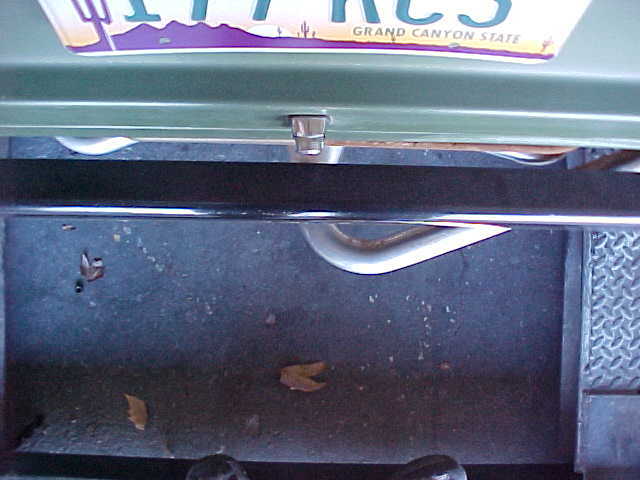 are completely tucked away, up underneath the car on either side of the engine. In fact, the only part of the system that you can see are the tips of the exhaust pipes sticking through the holes in the rear bumper. One other item that's worth mentioning here: before I installed this system, I was running a standard beetle-style exhaust setup (ie, both headers going into one muffler w/twin tailpipes). Mainly, this is because you used to not be able to find the original '73 Thing exhaust setup anywhere. After switching to the stock setup, I noticed that my oil temp went from around 200deg to a more comfortable 190deg. I think it has a lot to do with the fact that there's so much surface area, which helps it disperse heat efficiently. Anyway, like I mentioned in my other post, it's a pricey setup, but I think it's worth it. Tim, can you be more specific about your muffler? Got any pics? These are the only ones I have. I have hit the skid plates quite a few times and never hit the extractor or the muffler. The muffler is tucked in right behind the shock tower so it is somewhat protected from getting hit by rocks by its placement. I doubt it flows as well as the fatboy though. I went with a Empi Premium Header system and added a bugpack hide a way muffler which I altered a little. The clearance is ok and it looks and sounds great. To prevent nasty burns by the header I wrapped it with heat insulation wrap. radioman, in theory a 4 into one header system has an advantage over a "dual header" system on a 4 banger engine. Every 180° you have a stroke. This helps the scavanging effect on the heads. (Kind of draws the exhaust fumes out of the head. I have heard that before. But I wonder if going to a 'four-in-one" rather than a two into two....or whatever!!!! anybody think I should drop the Thing Shop header for a bag of snakes witha single QP??? I am running a bone stock 1600. I am retired but my wife has a lot of money>>HA HA HA. Some how I have a tendancy to think that the TS system is restrictive. And the S&S would help. BTW: Dom, great looking Thing you have there!! !And thanks for your input. Bill ps someday when someone expalins how, I;ll post a photo of my &3. I bought the S&S headers Thing system when I was a high school kid w/ disposable income. It rusted out when I was a poor college kid, and I replaced it with a cheap Monza bug system. To tell you the truth, I didn't notice any real power difference (but the Monza system looks like hell). I'm either going w/ the Thing Shop system or a stock-style system for the '74 next. My main concern is looks and durability now- I don't think that there's all that much performance difference when it really comes down to it. Radioman- I'd keep running the Thing Shop system until it wears out- they look pretty sweet. If you do decide to get rid of it and it's in good condition, let me know! FYI powder coat it first or it looks like hell. On a stock engine, the gains of a good four into one system are minimal over a two into one. Once you start getting into larger displacement and bigger valve heads, then you start to see some real gains from decent scavenging. VW Trends did a test a while back on various headers, and i believe it is still available on their website. Posted: Sun Aug 22, 2004 7:04 am Post subject: Re: Muffler Selection..